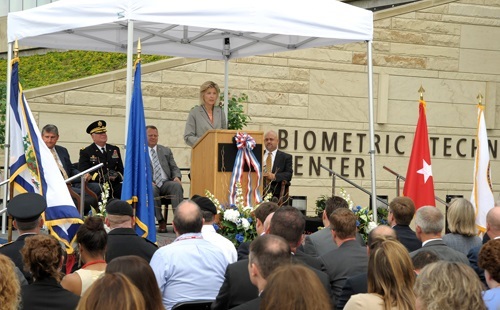 This week, the FBI dedicated its new 360,000-square-foot Biometric Technology Center (BTC), located on the campus of our Criminal Justice Information Services (CJIS) Division in Clarksburg, West Virginia. The BTC, an enhancement of the ongoing collaboration between the FBI’s Biometric Center of Excellence and the Department of Defense’s Forensics and Biometrics Agency, will—once fully operational—encourage even more joint biometric investigations, along with additional research and development. Over the past few years, the FBI has been working with the DOD to use biometrics to identity terrorists and criminals who threaten our homeland and our citizens. The BTC facility will enable the Bureau’s CJIS Division, which has the largest centralized collection of biometric information in the world, and the DOD, with its military biometrics database systems, to make advances in a variety of identification technologies like DNA, iris recognition, voice patterns, facial patterns, and palm prints. It will also allow us to move these technologies and resulting biometric tools more quickly from the laboratory into the hands of those who work to combat terrorism and protect the public from dangerous criminal activity. FBI and DOD biometrics experts working side-by-side in the facility will also focus on biometrics product certification, training, standards development, privacy rights, and research and development into emerging technologies.